Thanks to watching too many episodes of BBQ Pitmaster, The Mistah and I have started referring to ourselves in a rather bizarre third person way. I’ll try and explain. On each episode there are three new competitors. They have a friendly little showdown where they all have to submit their version of two different staples from the world of bbq….ribs, brisket, pork belly, etc. The judging is blind…entries are only identified to the judges by a number (#1, #2, #3). But the competitors get to watch the judging in a little Pitmaster Lounge. Lather. Rinse. Repeat. And this happens every single freaking time the judges refer to the entries. I think they could cut the show down to 30 minutes if they would stop this insanity. So The Mistah and I started jokingly coming up with random third person names for ourselves . Just last night I called him #1 Best Dada. And we pretty consistently call Libby #1 Best Baby (because hello, have you met her… she totally is). What does any of this have to do with cookies? Only that when I sat down to tell you about these cookies, I wanted to find a way to convey that they are the absolute. best. chocolate chip cookies I’ve ever made. So I pulled out the BBQ Pitmaster third person name generator and came up with #1 Best Chocolate Chip Cookies. I think it makes my point. What makes these so special? #1 Reason, they bake up thin AND chewy, that’s me. Thin and chewy is my own personal flavor of cookie perfection. #2 Reason, they nail the salty/sweet thing perfectly, that’s me. You definitely taste both but neither is overwhelming. #3 Reason, they freeze beautifully, that’s me. I don’t mean after you’ve baked them. They don’t last long enough in their baked form to worry about long term storage solutions. But you can scoop the dough onto a sheet pan lined with parchment and put it in the freezer overnight. The next day transfer the dough to a freezer bag, seal, and pretend you don’t know they are there. When you need a quick bite of something sweet, pull out one or two dough balls. Whether you choose to bake them off or eat them as is….that’s totally up to you. I’ve done both and to this question there really is no wrong answer. I have a second refrigerator being delivered this weekend….now that Miss Libby is drinking milk we buy it two and three gallons at a time and that takes up some serious refrigerator space. At least that’s the reason I used with The Mistah for why we needed it. That there would also be additional freezer space for things like cookie dough, well that’s just the butter on my biscuit. BAH Note: Go. Make. These. Now. You’ll thank me. And if you have a kitchen scale, I recommend using it. Makes measuring sooooo much easier. Again, you’ll thank me. The quantity of salt is not a misprint….2 teaspoons. PS, there was a lot of discussion on Alexandra’s original post talking about alternate oven temps, how thin these are supposed to be, etc. And she has pictures of the cookies after they’ve been baked. So you might want to mosey over there and take a look. Heat your oven to 375 degrees and line two sheet pans with parchment. Combine the butter, sugars, vanilla, and salt in the work bowl of your mixer (paddle attachment please) and mix on medium high for approximately 3 minutes until the mixture becomes light. Add the eggs and mix on medium for about 2 minutes until the eggs are incorporated. In a separate bowl, whisk together the 1 3/4 cups flour and baking soda. Add the flour mixture to them dough and mix on medium for about 2 minutes. Remove the bowl from your mixer. In yet another bowl, combine the chocolate chips with the remaining 2 tablespoons of flour. Use a spatula to stir the flour coated chocolate chips into your dough by hand. This is to keep you from over mixing your dough. 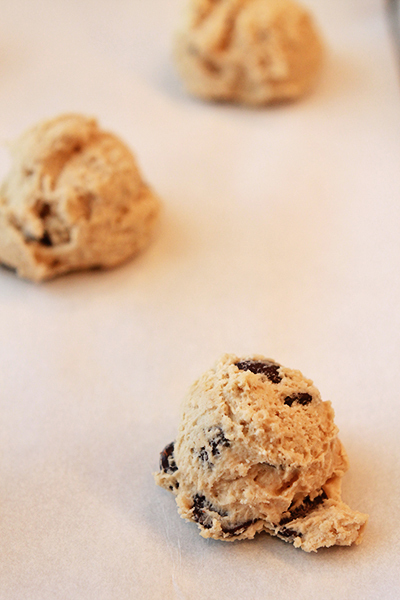 Use a small ice cream scoop to portion your dough onto the prepared sheet pans. You want each scoop to be approximately 1 tablespoon…give or take…and I would put no more than four scoops of dough on each pan….these spread like wildfire. Bake approximately 10 to 11 minutes or until golden brown. The cookies will be thin and the center may look a bit not set but don’t bake for longer than 11 minutes. Allow the cookies to cool on the pan for 5 minutes before transferring them to a rack to cool completely.